stolen peaks at the birds’ precious blue eggs (Mike peered down between the floor boards to see them) to the first appearance of a pointy, gaping beak eager for food, we observed the birds whenever we could. It was a privilege, really, to see their story unfold. 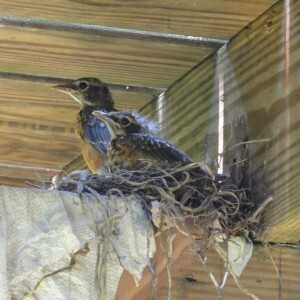 As their four nestlings grew, mom and dad robin tolerated my presence near their nest (I babysat while they hunted for worms), occasionally accepting offers of chopped blueberries. 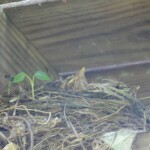 One week we could barely see the nestlings’ heads pop up for feedings (it took us a while to count all four); the next week the baby birds had grown so much that they were jostling for nest space. Two were noticeably larger than their siblings. I half-dreaded the soon-to-come empty nest. By early Sunday morning, one of the larger fledglings had gone. 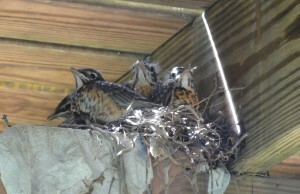 The two smaller ones were still in the nest, and the fourth fledgling was perched on the cap rail of our deck, reluctant to move. 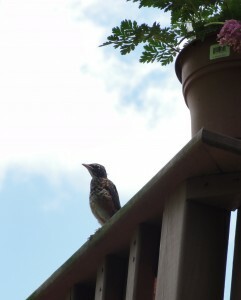 Mom chirped at him from a branch overhead. I imagined her encouraging him, coaxing him, telling him the world awaited. A few times I saw her land next to him. He would open his beak, eager to receive food, but she didn’t make a deposit. She would linger beside him for a few companionable moments, then duck under the deck to feed the littler ones. Later, I went outside to offer deck robin some verbal encouragement. He ignored me. As the youngster surveyed the world around him, I considered my own reluctance to leave the safety nests of my life. Home, jobs, daily routines, repetitive behaviors: these are the nests that human lives are made of. I don’t make changes easily, often retreating into familiar, and not always beneficial, comfort zones. Silly human, who am I to coax a robin to fly off my deck, when I am still afraid to drive on highways and perform handstands? 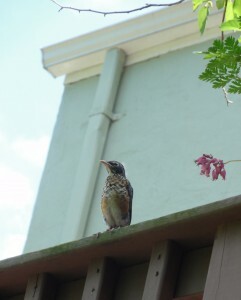 Late in the afternoon, deck robin flew, gracelessly and noisily, up to a tree branch. Within ten minutes, the two remaining babies left the nest as well, one after the other, struggling to stay aloft and awkwardly landing in our yard. Both hopped off into hedges, peeping frantically all the way. How do we fly? By growing up, making hard decisions, taking chances, falling in love? Running in marathons, riding roller coasters, going upside down? If a baby bird can fly, so can I. Sometimes gracelessly, peeping frantically all the way. 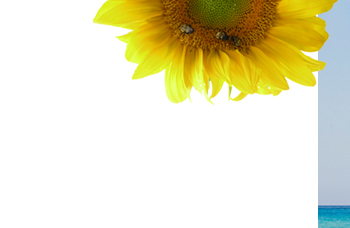 This entry was posted on Monday, June 15th, 2015 at 2:22 pm and is filed under Blog. You can follow any responses to this entry through the RSS 2.0 feed. You can leave a response, or trackback from your own site.